I've been tasting boat-loads of hedonistic delicious Pinot Noir's so far this year and thought it would be a great time, near the mid-point in the year to put-together a shake-n-bake list of my top ten favorites perfectly priced just under a Jackson [$20]. We all like to get a great deal and most of us like to drink great juice for prices that nearly seem too good to be true. After all great Pinot Noir under a Jackson, is no easy feat. 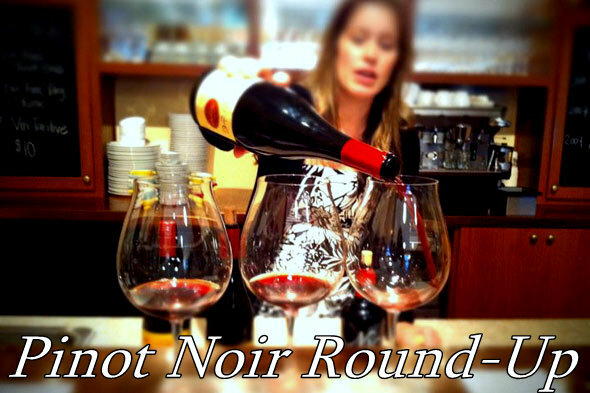 It's with that in mind, that I've put together mid-year round up of some of my newest Pinot Noir favorites.Ya know, I find it interesting that with all the many wines I've had the great pleasure reviewing so far this year, Pinot Noir wise, that Oregon Pinot is oddly absent from the review spotlight. I've tried a few under the $20 price point, but none of them really had that "wow" factor, the way these other wines I've put on this list below. If you're any kind of Pinot Fanatic or just a casual Pinot Noir fan who became enamored over the grape after watching the movie "Sideways" you're most likely well aware that PN is known as the "Heartbreak Grape" especially to folks who produce what can only be described as bottled poetry. In a world filled with various types and styles of wine, it is a well known fact that the Pinot Noir grape is fussy, finicky, difficult and will not just grow anywhere [sound like a few of my old girl-friends]. Of all the grapes in world Pinot Noir is a variety characterized as being notoriously vulnerable to to problems like mold, frost, and disease and why? It's mostly due to the grape’s very thin skin, coupled together with the fact that it also can prove difficult for the winemaker in the vinification process and you have a very pricey proposition. The reason I bring this up is because in order for the average Pinot Noir producer to go through all that effort with this grape, then bottle a great product and bring said wine to the market for under $20, while still making a profit is nearly a modern miracle. So you may not want to just sit idly by thinking these kind of deals on Pinot Noir will be around forever. The good news is that prices on some seriously good juice is still low, so I would stock up now, while the price is right. In this vein, I have put together a list of Pinot Noirs which in my opinion are drinking rather fabulously right now, will knock your socks-off, while not breaking the bank. 1. Paraiso 2008 Pinot Noir, SLH: I scored this wine 91 points. Fully flavored and balanced with firm acidity. Seducing aromas draw you in again and again, a winetastic experience. A wonderfully style driven Pinot Noir, that will pair with many types of food and is great on its own. Expressive aromas and enticing flavors await your purchase. Definitely worth the price of admission. Other Voices: The International Wine Review gave them 90 points. This wine sells for $18 in a few Costco here in California. 2. Belle Glos 2008 Pinot Noir Meiomi Sonoma Coast (Caymus): The next wine is a wonderful expression of Pinot Noir for a winetastically low price; which is the 2008 Meiomi. It's pronounced May-oh-mee and you can get this beauty at your local San Diego Costco. Not sure if any other Costco carries this wine, but if you happen to be shopping in San Diego and are looking for a inexpensive well built Pinot Noir, folks this it. It definitely won't break the bank, but it will feel like you're robbing the bank. Expressive baking spices, ripe fruit aromas abound and a silky mouth-feel. I immediately scored this wonderful wine 90 points. Why the high score, good question, because this wine tastes like it cost way more than the price tag of $17 making the QPR is off the charts. 3. Byron PN SMV 2008: I opened this one just the other night, paired against some seared Ahi and mushroom risotto, in a word winetastic. A huge plume of rich cherry, strawberry and plum aromas streaming from the the glass, accented by nuances of nutmeg, pepper, smoke, and a dusting of vanilla. The wine’s perfectly poised fruit to acid balance makes this wine incredibly food-friendly. My palate was struck by wave after wave of a rich cherry and raspberry pie filling, wrapped around the smokey vanilla-tinged wonderfully integrated oak, with a small dose of rich earthiness. The mouth feel is silky, the brilliant finish is long and sumptuous. This wine is drinking FAB, right now and will only get better over the next few years. A real stunner, I gave this wine 93 points and it sells for $18 most places or $26 through the tasting room. This wine is widely distributed here in California, score as many as you can, a run don't walk recommendation. 4. Taz 2008 Pinot Noir: Another wonderful wine from Santa Barbara County. With so much hoopla around RRV PN it can be easy to forget about the wonderful expressions of Pinot Noir, coming from this area. In the glass you'll find a wonderful cranberry colored core, floral and baking spice aromas swirling about, leaning toward the strawberry end of the flavor spectrum. On the plate a well-balanced attack of baking spices, red berry fruits and finish is plush. I scored this wine 91 points. Just a fantastic wine from the SBC region. Taz really delivers a consistent wine tasting experience. Where to Purchase: This wine sells at most places as low as $18 at most online stores. I purchased mine at the San Diego Wine Company on Miramar Road. 5. Veramonte Ritual Pinot Noir 2009: Woo-hoo, this wine hit it out of the freaking park, this is seriously great juice for the price. After the first pour, a shimmering dark crimson colored core. Getting my fat half-Irish nose down into the glass [not an easy feat] a palette of aromas await, black cherry, raspberry, cola and baking spices all inviting the first sip. Some other reviewers were wine-ing about the 14% abv saying that it was most likely much higher, but after my first long slurp, I found this wine is made in an immediately appealing and approachable style that will impress many with its power and finesse of flavors sporting a balanced ABV. A raft of flavors coming your way, cherries, raspberries, light touch of blue-berries sweet vanilla, tobacco, baking spices and fat-slap of bacon fat, wrapped around some mushroom risotto like nuances, the mouth feel is dry, silky and the finish is plump. What the hell are you waiting for? Get yourself a case of this wine, dressed to impress and will be asked on a second and third date. It sells for a SRP of $20 and can be found at a few online purveyors of fine wine and spirits here. You could also most like have Bevmo order for you as they carry all the other Veramonte wines except this bottle. I gave this wine a score of 92 flavor filled points, enjoy. 6. Valdivieso Reserve Pinot Noir 2009: In the glass a rich looking strawberry colored core and dancing wine-diamonds [tartaric acid] in the bottom of my glass. Meaning if you happen to grab some of this vino, you have bought flawless wine, just not an aesthetically flawless wine, which is no big deal. On the nose a wonderful perfume of dried strawberries, rich earth and raspberry. After the first splash down, this immediately appealing Pinot is soft but lush, presenting a raft of vanilla, cinnamon and sandal wood flavors, with a healthy splash of raspberry and strawberry pie filling leading to the plush finish. You can find this wines selling in most places for right around $17 or under. Older vintages are sold at Wine Zap and wine-searcher reveals it's sold in a number of British online wine stores. I gave it a score of 90 points, a superb Pinot Noir for the price, look-out RRV, Chile will have you on the run with these prices and high quality. 7. Rodney Strong Estate Pinot Noir 2009: This wine is a steal under $15 and still a fantastic bargain under $20. I found this wine to have a garnet colored core. The first whiff, reminded me sweet baking spices, strawberries and rose petals. On palate a nice attack of dusty-spices, sandalwood, a silky mouth-feel, sweet vanilla and baked strawberries, mouthwatering acidity, leading to the plush finish. Drink now and drink often, I gave this wine a score of 89 points, with a hearty buy recommendation. Makes shopping for wine just a little bit easier when you have a nice list to head out to the wine store and stock up on a few palate pleasing favorites. If you have a fave Pinot Noir, under twenty dollars that you feel that I've overlooked, please by all means let me know. I would be glad to pick one up, give it a swirl and throw it in the review spotlight, if it does of course have that "wow" factor. Until next time folks sip long and prosper, cheers!